IASB Deputy Executive Director Ben Schwarm discusses the options under consideration by the legislature that will allow the release of state school funding. House Speaker Michael Madigan announced last night that the legislative session scheduled for Wednesday, Aug. 23 has been canceled. 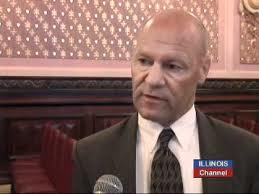 The Illinois House was preparing to take up an override vote on the governor’s veto of SB 1. The Speaker noted that recent progress toward a compromise on school funding among the legislative leaders led to the decision. The leaders will meet again on Thursday in an attempt to iron out remaining differences on an evidence-based funding model. The House will likely reconvene next week. August 29 is the deadline to take action on the veto of SB 1. The Illinois House of Representatives will return to the Capitol on Wednesday (Aug. 23) to address the governor’s amendatory veto of SB 1, the school funding reform legislation. The Senate has already voted to override the governor and the House has until Aug. 29 to take some type of action on the bill. Though no motion has yet been filed, it is expected that the House sponsor of the bill will file a motion to override the amendatory veto. If such a motion is approved with a 3/5 majority of House members, SB 1 would become law as passed by the legislature in May without the governor’s proposed revisions. If the motion fails, SB 1 would be dead. The legislative leaders have been meeting over the last few days in an attempt to find a compromise on the concepts of an evidence-based funding model for the distribution of general funds to school districts. Republicans are concerned about provisions of SB 1 that direct additional funds to Chicago Public Schools. They are also pushing for additional provisions, including mandate relief for downstate school districts and a statewide scholarship/voucher program that would help fund non-public schools. Procedurally, there are a number of ways to implement a compromise. They could let SB 1 die, then replace it with an agreed-to funding plan contained in another bill (or bills). Or, they could override the veto on SB 1, thus enacting it into law, then follow up later this week with another bill (or bills) that contain Republican-friendly provisions. With no compromise, bill sponsors in the House could muscle through an override of the governor and enact SB 1 as is. But because of the required 3/5 majority vote, this would take several Republicans to vote for the bill and against the governor. With no changes to the bill or a promise of trailing legislation, this seems unlikely as no House Republican have indicated he/she would cast such a vote. No voucher legislation has yet been filed in the legislature, but preliminary drafts have surfaced. In these drafts, taxpayers would be allowed to receive an income tax credit equal to the amount of tuition paid to a non-public school. In some drafts, the aggregate statewide amount of such tax credits could reach $100 million in the form of “scholarships” to private or religious schools. The scholarship-issuing organizations, depending on which version of the bill it is, could be a not-for-profit organization, the Illinois State Board of Education, or the Illinois State Scholarship Commission. In some cases, the scholarship could be used in another public school district so a student could attend a school in a district he/she does not reside in without paying non-resident tuition. Also, in some versions, the local public school district would have to administer the required standardized assessment to those students who have a voucher in a non-public school. Obviously, there are many concerns IASB has with these proposals to re-direct state funds to non-public schools. School board members and administrators are urged to contact their legislators and voice their objections to these proposed schemes.